Churros are typically thought of as a cinnamon-sugar-coated pastry. However, this take uses a honey-chili sauce to add a sweet and savory kick. 1. Melt butter and water in saucepan over medium heat. 3. Remove from heat and stir in eggs one at a time. Add the honey, sugar and vanilla and mix well until a dough forms. Spoon dough into piping bag fitted with star-shaped nozzle. 4. Apply nonstick spray to sheet tray lined with parchment paper. Pipe out dough into small spiral shapes. 5. In deep fryer or saucepot, heat oil to 360 F. Once oil is hot, drop churro spirals into oil one by one, using a spatula. Turn to cook each side until golden brown in color. Remove from oil and place onto absorbent paper; let cool. 6. In small bowl, mix together honey and chili paste. Stir well. 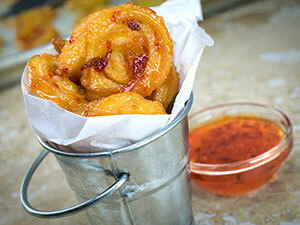 Once churros are cool, brush with honey-chili sauce using a pastry brush, or use sauce as a dip. Serve immediately.